I’ve had many an enlightening experience on this soon-to-pass 2015. Unsurprisingly, Star Wars: The Force Awakens (a.k.a. Star Wars Episode VII: The Force Awakens, for the sake of us pedants) was one of those for me, yet the way it managed to be so was actually quite unexpected and welcome. More on that later, I promise. Let me just continue by saying that at it’s worst, The Force Awakens is pure, unadulterated escapism. At it’s best, it reminds you what’s good about storytelling, film and the social act of going to a crowded theater. 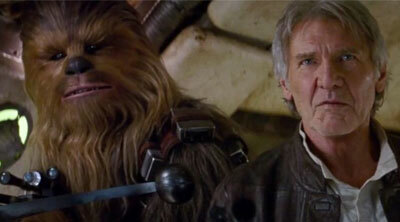 The now-Disneyfied myth/universe/IP/marketing machine that George Lucas brought to life is in very good hands. 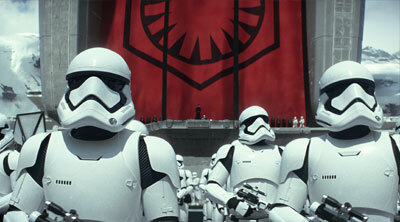 The plot, as it goes this time around: the First Order, a remnant faction of the old Empire led by the mysterious Supreme Leader Snoke (Andy Serkis, the mo-cap Lawrence Olivier), has gained power and is now threatening the Galactic Republic 2.0 with polished versions of Imperial weapons and tactics, as well as a Dark Side wildcard in the form of die hard Darth Vader groupie Kylo Ren (Adam Driver). Luke Skywalker (Mark Hamill), last of the Jedi order, disappeared years ago out of guilt for screwing up Ren’s Force training. Therefore, the only power standing against the First Order is Luke’s sister Leia Organa (Carrie Fisher) and her rogue Resistance, a redux Rebel Alliance. Leia sends Poe Dameron (Oscar Isaac), her most daring fighter pilot, on a mission to retrieve a secret map to Luke’s whereabouts. Let me point out that I haven’t even gone past the classic yellow prologue that crawls at the start of every Star Wars film. Anyway, Poe receives the map on Jakku, another Tattoine-ish desert planet filled with wreckage of a space battle fought long ago. 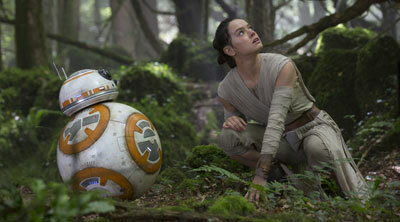 Ren finds and captures Poe there, but not before the prisoner hands the map over to BB-8, his droid and must-have Christmas toy, which runs off and befriends plucky Jakku scavenger Rey (Daisy Ridley). 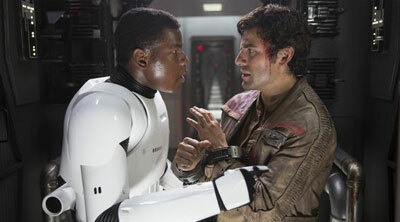 Poe is freed by Finn (John Boyega), a First Order Stormtrooper who’s had a change of heart, and together they crash land back on Jakku in search of Poe’s trusty rolling buddy. Rey and BB-8 meet a Poe-less Finn, as luck would have it, then the trio is chased by the bad guys out to space where they must find a way to deliver the droid and its contents to the Resistance. They get a hand, as it turns out, from Leia’s old flame Han Solo (an appropriately cranky Harrison Ford) and his hairy partner Chewbacca (Peter Mayhew). The odds of all this happening would melt C3PO’s circuits and even power Douglas Adams’ Heart of Gold for at least a couple of laps around the known Universe. Part of the fun of the original Star Wars flicks stems from all these ludicrous coincidences. Their sense of whimsy is one of the many things rescued in this installment. Lucas pulled a real miracle back in 1977. He created something never before seen on film and giving it both grit and heart. But his interests changed, as it happens with age. He still gave the fans the spectacle he thought they wanted. Yet somehow, he lost his focus on the heart part during his more recent endeavors. Fans cried of ruined childhoods. A fed up Lucas, seemingly out of spite from the backlash, sold his baby to Mickey Mouse’s lucrative IP FarmVille (see Pixar, Marvel). 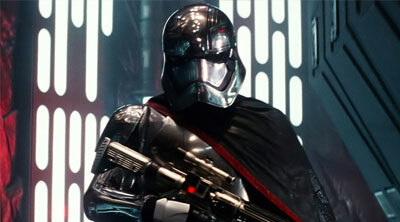 Director J.J. Abrams, Disney’s choice to spearhead their revival of the Force, was really an no-brainer. He’d proven his efficiency both in action spectacle (Mission: Impossible 3), sci-fi franchises (Star Trek) and heartfelt Spielbergian flights of fancy (Super 8). Still, what he’s done is nothing short of the impossible. His film honors Lucas’ mythical vision, recent warts and all. All the while pumping it with enough adrenaline and cheer to bring back the old fans while converting all cynics in the process. 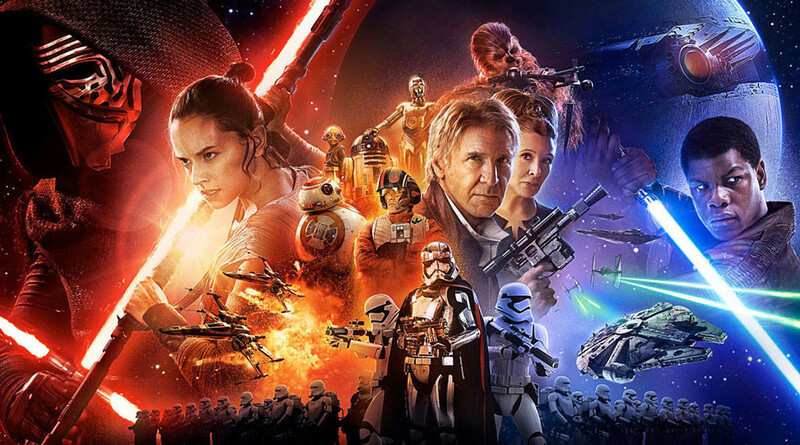 The Force Awakens is equal parts sequel, reboot and retread. You’ve seen this story before, not just in Star Wars but in many other movies since. Yet unlike Santayana’s condemnation of historical repetition, we do remember and we’re glad it’s all happening again. The callbacks to previous Star Wars installments are irrelevant to understanding the plot and enjoying the film, but oh how they resonate with those who grew up with them. Observant fans will recognize and appreciate the touches. Some obvious (hey, everybody, it’s the Millenium Falcon! ), other subtle (conversations between Stormtroopers have changed little in 38 years). From the very first scene there are images and story beats directly pulled and rehashed from A New Hope, The Empire Strikes Back and even Return of the Jedi. Only the O.G. followers among us would mind those, and speaking on behalf of that demographic, they will be ecstatic. (After all, is it really a rip-off when you’re stealing from yourself?) It’s a credit to the work of Abrams’ team that the big plot twists in the movie (which are really, REALLY obvious if you give them some thought) have been so well guarded by the theater audiences in a way rarely seen since The Crying Game. It’s also a treat to see Driver play Kylo Ren for laughs while maintaining him dark, dangerous and even tragic. I’m especially glad, as a fan of many film genres, to see a young talent such as Domhnall Gleeson (About Time; Frank; Ex Machina; the Black Mirror series) be given free reign to forget motivation and just chew as much scenery as possible. 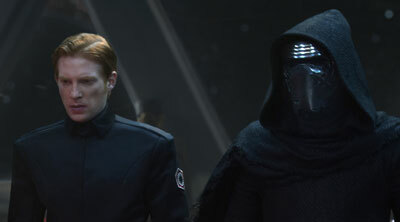 His General Hux earns a loving place beside the likes of Peter Cushing, Julian Glover and Kenneth Colley in that noble pantheon of dry English thespians essentially forced to play Nazis in Space. I’ve alluded to being a Star Wars fan before. I was born exactly two months before the first movie premiered. John Williams composed my lullabies. Although raised Catholic, my childhood trinity was Luke, Han and Leia right up until Ford’s Indiana Jones became my Jesus. Although more forgiving than most, I actually was disappointed that Lucas’ prequel trilogy was not in fact the Second Coming and was just “okay” as a whole. That experience, as many others pulled from Star Wars, became life lessons for me. So I meant it when I spoke at the beginning about The Force Awakens being an unsurprisingly enlightening experience. They’re preaching to the choir in my case, and the hymns, even rearranged, still hold true. 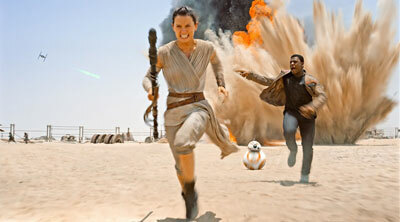 Freed from the prejudice of Star Wars’ historical cinematic value and once revolutionary but now outdated technological advances, everyone in my theater was able to enjoy The Force Awakens for what it and the whole Star Wars franchise represents at its core: uninhibited joy and youthful optimism, bottled up with a dash of lightning. Disney paid a pretty penny for this universe and will milk it for all its worth. Regardless, if the future follow-ups are half as good as this one, it’ll still be amazing. The Force Awakens has revived my faith in popcorn cinema, and its Force is strong. Now showing only in theaters. Movie description: A noble Star Wars homage-relaunch made by caring fans that showcases the best examples of popcorn escapism. When Can (and Should) You Tell the Truth About Santa?